Each pupil should choose one sheet of origami paper. For this lesson the measuring tool is necessary and also 2 colored markers. Folding instructions: With two folds make 4 congruent squares. Activity: Draw two different colored lines on the segments formed from the folding. Activity: Mark the point of intersection of the two segments. A discussion question: What is special about the two intersecting segments? Use your measuring tool and explain your answer. The pupils should be encouraged to use their measuring tool when relating to the angles between the two segments. Answer: The angle formed at the intersection of the segments is a right angle and the segments are perpendicular to each other. It is understood that the pupils have already studied the concept of perpendicular segments of a straight line. Folding instructions: Fold one side of the square to the line of symmetry and open your fold. Activity: Color the new folded line with the same color as the parallel line of symmetry. Check that the correct line has been colored. A discussion question: Are the two same colored parallel segments perpendicular to the other colored segment? The pupils use the measuring tool to check the angles and distance between the two parallel segments and the other colored segment. 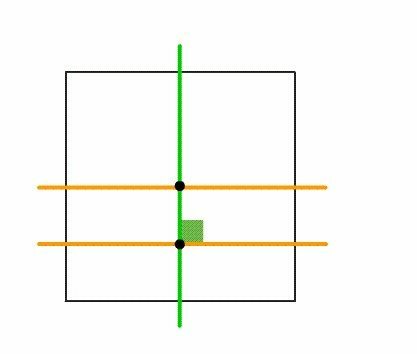 Answer 1: The two orange colored segments are perpendicular to the green colored segment. Answer 2: The two orange colored segments are parallel to each other. Seeing the animation the pupils will be able to relate to the definitions of parallel and perpendicular straight lines. A discussion question: How can you verify that the two orange colored segments are parallel? Answer: Drawing several perpendicilar segments of the same length between the two parallel segments shows that the two orange colored segments are parallel to each other. Several segments should be drawn between the two parallel segments in order to show that the length of these perpendicular segments remain the same and the lengths of these drawn segments are the shortest distances between the two parallel segments. Some ladders are made using equal length parallel pieces.There are other ladders where the pieces are parallel but they are not the same length. Can you draw these types of ladders? There are several definitions of parallel lines including the statement that if two lines are perpendicular to a third straight line then it can be stated that these two lines are parallel to each other. Folding instructions: Fold a side of the square onto the the parallel line of symmetry as shown. Folding instructions: Fold the other two sides of the square onto the shown line of symmetry. Folding instructions: Open all the folds on your sheet. 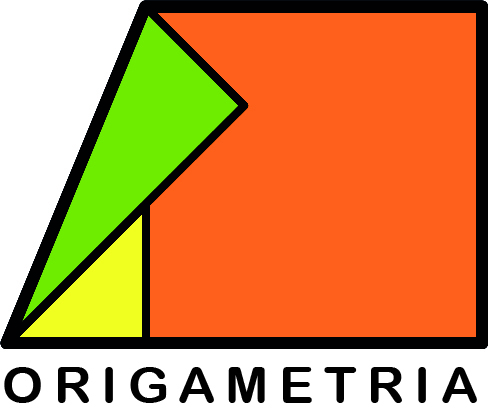 Activity: Color the two new segments with same color as the green line of symmetry. Question: What is special about these two segments? How can you check? Pupils should be encouraged to explain how they found that these segments are parallel. 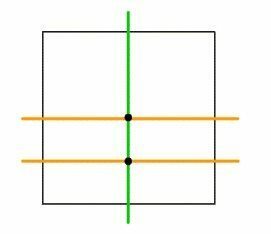 Answer: Comparing the perpendicular segments between the green segments shows that these perpendicular segments have the same length. 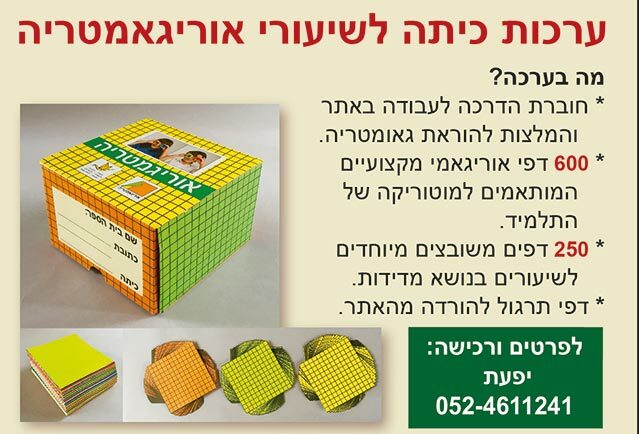 The pupils should use their measuring tool and discuss their methods in finding the answer before showing the animation. Refold the side as shown. Folding instructions: Refold the other two parallel sides of the square onto the other line of symmetry. In your file keep the folded paper. The next lesson: Parallel lines. Origami sheets 15/15 cm and measuring tool. If two straight segments are both perpendicular to a third straight line then the two segments are parallel. A transversal line that is perpendicular to one of two parallel lines will also be perpendicular to the other parallel line.